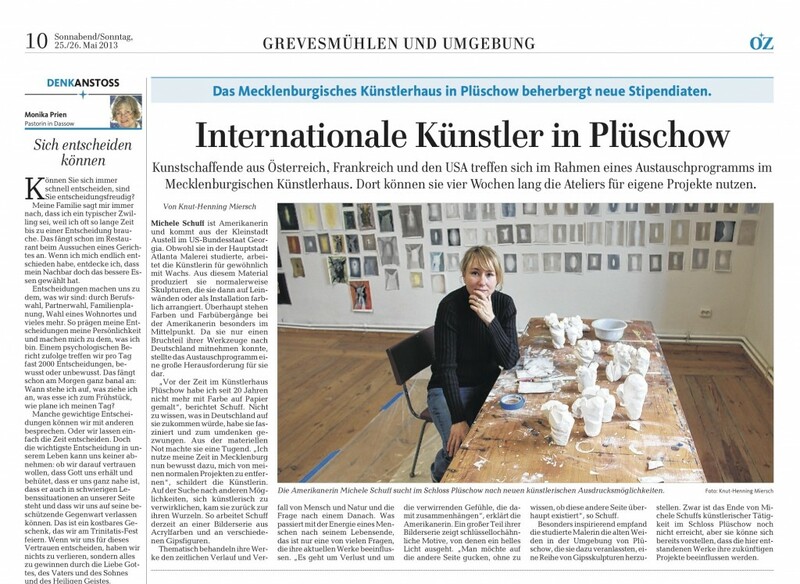 Whitespace artist Michele Schuff is currently completing a 4-week residency at the Schloss Pluschow in Mecklenberg, Germany. Schuff, native Atlantan, traditionally works using an encaustic wax medium, creating colorful, glowing works with undulating surfaces. In her current program at Schloss Pluschow, a converted Rococo-styled manor house in the German countryside, Schuff is both rediscovering her roots and experimenting with new materials. The Baltic News recently published an article highlighting Schuff’s work and a dialogue about her experience in Germany. The article, written in German, discusses both Schuff’s experience as an American abroad and an artist working in a foreign setting. Schuff goes on to explain to the reporter that her arrival to Germany left her feeling off-balance and disoriented, but from this instability Schuff saw the chance to immerse herself within new art forms, challenging herself to work outside her usual tendencies. The article goes on to discuss the ongoing theme in Schuff’s work: the downward spiral of humanity and nature, the concept of time, and her own mortality. Schuff stresses in the article that her art is meant to express loss and the alienating emotions it creates, however her work also incorporates the positive through the use of keyhole motifs, in which a keyhole is depicted with a stream of light shining through. These elements are meant to represent the desire to look through to a hopeful other side, even in the face of uncertainty. During her residency, Schuff has drawn inspiration from the architecture of Schloss Plüshow, extracting aesthetic motifs and incorporating them into a series of gypsum sculptures—an exciting and definite change from the iconic encaustic wax style that she has been working with for the past 20 years. This new body of work was not born out of pure inspiration but more importantly, necessity—Schuff was unable to bring her wax materials overseas and was thus forced to experiment with new material. We wish Michele Schuff the best of luck during the rest of her residency, and we cannot wait to see her new work and where it is headed! This entry was posted in Uncategorized on June 1, 2013 by Whitespace.